Nuts about nuts like us? Enjoy this crunchy blend of peanuts, almonds and hazelnuts. CONTAINS: PEANUTS, ALMONDS AND HAZELNUTS. MAY BE PRESENT: OTHER TREE NUTS, MILK PRODUCTS, SESAME SEEDS AND SOY. 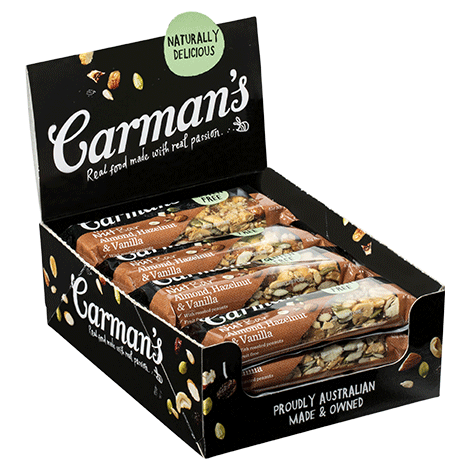 Nuts (Peanuts 35%, Almonds 24%, Hazelnuts 2.6%), Glucose, Pepitas 8%, Honey, Brown Rice Syrup, Puffed Rice, Psyllium Husks, Cinnamon, Natural Vanilla Flavour. To prove you’re not a robot, can you tell us what’s 5 + 6 ?